Nick Otto for the Washington Post Lisa Lin makes a video of her mother describing the savory fried butterfly crackers. SACRAMENTO, Calif. – Lan Lin doesn't go around telling her friends she's famous on Instagram. For that matter, Lan, 73, isn't really sure how Instagram works. 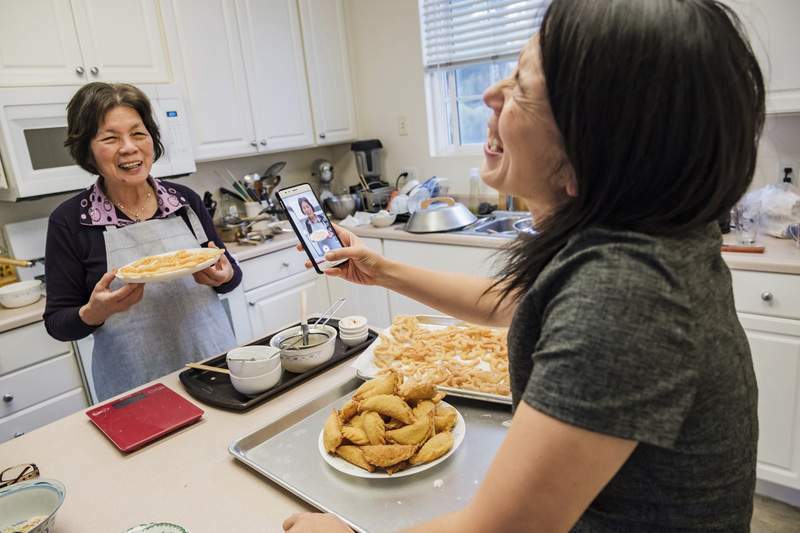 Nevertheless, first-, second- and third-generation immigrants across the country have rallied around the videos her daughter Lisa films as she cooks traditional Chinese dishes with her mother. Although she can't for the life of her figure out why, Lan has become an online mother figure and cooking teacher for thousands of young people she's never met. In an early video posted to Lisa's Instagram account, Lan stands in her tiny San Francisco kitchen, sporting her favorite floral print apron and pink plastic slippers. She's making an enormous sticky rice casserole with homemade Chinese bacon, dried shrimp and vegetables. As she cooks, she explains the recipe in Taishanese, the dialect she grew up speaking in Taishan, a city in South China's coastal Guangdong province. Lisa leans over her mother's shoulder, recording the video on her phone. “I asked my mom how much rice is in here, and she said seven cups,” Lisa said. “But she apparently used this cup to measure it.” Lan, or Mama Lin as her daughter affectionately calls her, holds up a tiny plastic teacup she was handed on her flight to America 32 years ago. It's been her standard of measurement ever since. Lan never relies on exact measurements or cooking times, so Lisa retests her mother's recipes before posting a simplified version to her blog. For many of Lisa's 66,000 Instagram followers, cooking along is an afterthought, anyway. They watch Lan's videos for a sense of belonging, a reminder of grandmothers still in China, dishes they haven't eaten since childhood, recipes they never thought to learn before moving across the world. On this November day, in her daughter's Sacramento apartment, Lan is wearing new pink slippers and a polka dot apron as she pours sweet rice flour into a metal bowl to make tang yuan, or black sesame dumplings. Lan, Lisa and their family always make a version of these glutinous rice dumplings for Chinese New Year, crowding around Lan's counter and taking care not to stain their hands and clothes with the jet black filling as they form each ball. At first, Lan weighs the flour on a small kitchen scale and sprinkles in tablespoons of hot water, keeping her measurements exact, while she stirs with a chopstick. “This doesn't feel right,” she says, putting the chopstick aside and poking the dough with her fingers. “I've been making this without measuring anything for years.” Lan can tell the dough is too dry. Lisa's efforts at a concise recipe have been defeated, the measuring spoons are thrown in the sink, and Lan smiles as she pours boiling water straight from her kettle into the bowl. Despite what her daughter tells her, Lan isn't convinced any of Lisa's followers actually watch her videos. “Don't you think it's weird that people like watching an old lady, and hearing an old woman's story?” she asks, as we sit around Lisa's island counter eating light, pillowy turnip cakes Lan has fried for lunch. When Lisa recorded the first video, she didn't intend to share it. Lan had just turned 70, and Lisa realized she had limited time to learn from her mother. She wanted to post a version of her mother's peanut candy to her food blog but struggled to replicate its snappy texture and amber hue. So she asked Lan to make it while she recorded. When Lisa shared the video on Instagram, hundreds of excited followers reached out. “That's when I knew, this was different,” she recalls. Gillian Der, another of Lisa's followers, couldn't believe what she was hearing when she came across a video of Lan and Lisa chattering in Taishanese as they shaped and fried sesame balls. In 1986, when Lan moved to Portland, Oregon, from China, she cooked in her brother-in-law's restaurant. But she didn't think of it as a real profession. “Cooking was more of a survival thing,” she told me. In her videos, Lisa regularly trails a few steps behind her mother as she tries to translate, sometimes losing track of what Lan is doing, unable to identify a spice her mom has thrown in the wok. When Lan is finished adding boiling water to the rice flour, and the sweet sesame paste is set to chill in the freezer, she pulls a black binder from Lisa's bookcase. In it are hundreds of pages of Lan's handwritten notes, with little sketches accompanying every recipe they've made together. The notes and drawings illustrate how to properly fold dumplings, wrap sticky rice in bamboo leaves, dehydrate dried shrimp and properly mix a variety of doughs. Lan often shakes her head in exasperation when they're done filming, Lisa tells me. “It would be best if you were still a lawyer,” she'll say, “I wouldn't even have to teach you any of this.” No amount of explaining can convince Lan that running a food blog, in this day and age, constitutes a real profession.